Well, there it is. I'm leaving my teaching job at the end of the year. It seems like it hasn't been that long since I started on the side project that became Millennialmoneyman.com. In the beginning, that is all this website was…a side hustle, dream, stupid thing that I wasted time on, whatever. I started posting on a free blog website about 5 months ago as a way to let off steam and vent about the frustrations that I had with the world around me. I posted an article and shared it on my Facebook feed, and it got a bunch of shares and views. A really good friend mentioned that I should create my own website, and I figured it would be pretty easy and fun. I had no idea what I was getting myself into. I had just finished putting my head down and paying off my student loans at an almost unbelievable clip, while all of my friends were racking up a ton of debt and hurting their future chances at building any real wealth. I paid off almost $40,000 in student loans in a year and half, and had no idea why other people weren't doing the same things as me. I was an average Millennial making a teacher's salary, but it seemed to everyone else that I was doing the impossible. Every day I had to justify to myself why I was doing what I was doing to get rid of my debt: Do the unpopular things, sacrifice, delay your gratification, and be different than everyone around you. You don't have to live with student loan debt forever, and it's possible to start building wealth at a young age. That brings me to my job. I honestly have no complaints about my job or any of the people that I work with. The school that I teach in is incredibly supportive and located in a really cool community. I'm a high school band director (no jokes about band camp please). The arts unfortunately aren't supported very strongly in most places like they should be, but in this small city they are. Honestly, it is a dream job for teaching music. The kids have been awesome, the staff is incredibly talented, and my job is fun. However, I knew that my love of teaching people about how money works didn't quite fit with what I saw for my future as a band director. The achilles heel of my job is that teachers don't make a lot of money, and I desperately wanted to have a path towards building real wealth and helping other people become debt free like I was able to do. After I started Millennialmoneyman.com I noticed that other people were reaching out and asking me questions about how I paid off my loan debt so fast. Emails and website comments started rolling in, and I LOVED answering them and trying to help people get out of their debt in any way that I could. People that feel like they are trapped in debt want hope, and I am passionate about giving that hope to them. I'm sure you are wondering what my plan is. Most people don't just quit their job and take leaps of faith, and I totally understand why they don't. This is not for the faint of heart, it's really scary. Fortunately, I have a vision and a plan that takes a lot of the risk off of the table (in theory). The most important thing I can explain is that I am not doing a blog full time, but I am creating a financial education company. One of the things that I tell people all the time is to monetize your existing skills. I am a teacher, and I am really good at education (I financed a degree in it!!). The way I see it, I am still staying in the same business…but the curriculum is changing. I want to teach people about money in as many ways as I possibly can. Books, live seminars, my website, etc. In regards to the live seminars…my entire working life has been spent standing in front of people and talking for a set amount of time. I've picked up a ton of public speaking skills that I can utilize to teach young people about money. The other advantage I have is that I have been in the schools and know exactly what kids know about money. Spoiler alert – they don't know anything. One of the reasons that I saw an opportunity in my new company is that they really really WANT to know about money. Everyone wants to be rich someday, it's not a freaking secret. The school systems are failing the kids on a financial perspective from the state level down, but will be forced to push them towards financing expensive college degrees in the name of successful education. We are literally pumping out people in this country that will be racked with tens of thousands in debt and have no idea how to handle any aspect of money. The problem goes WAY deeper than learning how to balance a checkbook, and they haven't really been taught how to do that correctly. They don't even know what capitalized vs. simple interest is, but they will have to pay it for years after college. It's really scary. If you were wondering; yes, I am financially set up to start this company/adventure. After I paid off my student loans, I continued to sacrifice in a successful attempt to build some wealth as a young person. My fiancé and I are both teachers, but we have become so good at living below our means that we were able to save up a REALLY good amount of money to create a cushion for this type of crazy dream. By paying off my debt and not taking on any more, we are able to enjoy “life liquidity” – I made that up, don't steal it. We can make gutsy, seemingly ridiculous decisions like this because we live below our means and delay our gratification. It's one of the things that I will be teaching in my future seminars ;). I could go without making a single dollar for a year and not even start to freak out…but it won't play out that way. I'll hustle and work as hard as I can, and we will be just fine. In fact, we are getting married in two weeks, and going on a sweet honeymoon in about a month. Life is good, regardless of the major leap of faith that I am about to take. Wow, big news. Best wishes for your marriage and your new company! Congrats on making the leap of faith. Looking forward to see where this road takes you. Thanks man, it’s a little scary but I’m REALLY looking forward to it!! Congratulations! I’m sharing a Tx-based financial education company that I figured you def. should know about, since it integrates teaching and financial ed. Best wishes to y’all! Appreciate it, thanks for the share. Congrats on taking this leap of faith into your next adventure! You’re still a teacher, but now you can focus on teaching to a much bigger audience. That is something that made me decide to pursue my writing an blogging career as well. I only get to teach about 45 students a year in the classroom, but I can reach a much larger audience online. I think it is a great step that you are taking! I love the message. 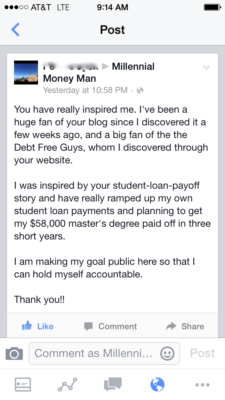 When I have spoken in the classroom about debt free living the message really seems to resonate with students. 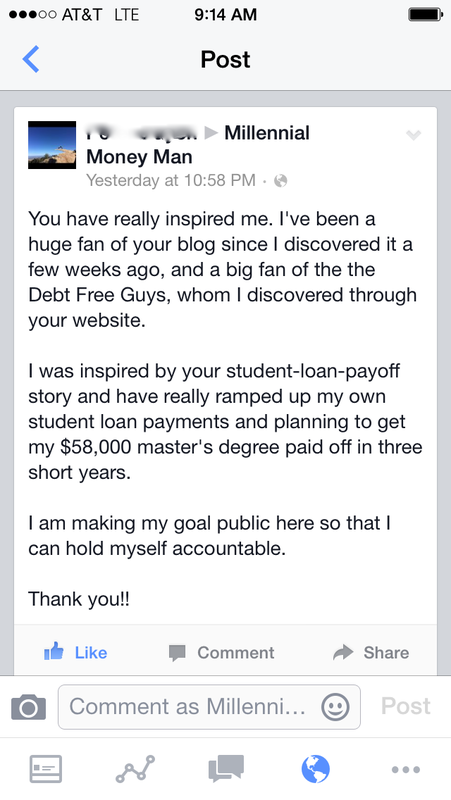 You have made incredible progress with your blog and I admire what you are doing. Keep up the great work! I enjoy sharing your content. Kids eat it up. They have seen their parents struggle financially and don’t want to have any part of it. I really appreciate the kind words and support! I was recently nominated for the Inspirational Blogger Award. Part of this acceptance is nominating fellow bloggers I find inspiring, and I thought of you. Don’t feel as if you need to pass the nomination on, but I just wanted to say what you’re doing here at Millennial Money Man is inspiring, and to personally thank you for being supportive since the start of my blogging journey! Alyssa – you rock! Thanks for the nomination; I’m looking forward to reading more of your content. That is such exciting news for you! You are so right about the school systems failing to teach our kids about finances. I think the only thing I remember learning in school is how to balance a checkbook. I think they try to teach them a little more than that nowadays, but it’s still not enough. I hope you can help with your new business and I wish you the best of luck with that and your new marriage! It’s sad right? The school system recognizes that there is a problem…but there isn’t enough room in the curriculum with all of the standardized testing (which isn’t going away any time soon – HUGE $$$$ maker for the publishing and test companies). The kids at my school have access to one class that is supposed to teach them about investing and money management, but it’s a blow-off class for seniors. Thanks for the kind words! Awesome! Mad hustle props to you. This is great! Look forward to reading about how the new venture works out for you! Wow – that is a leap of faith to quit your job. Best of luck to you in your new educational venture! Thanks so much! Not going to lie, it was pretty scary…but I love my new life. How’s it going since the big move? Kinda thrilling yeah? After 3.5 years, I’m thinking of going back FT bc I miss the camaraderie! It’s been great!!!! I’m jumping into other business opportunities in addition to running the blog. Never would have guessed that the skills you need to run sites like these are in such high demand. Congratulations and good luck in the next adventure! You have inspired me so much! I took a leap of faith and quit my job a few months ago to start pursuing my own thing. Seeing all you are accomplishing gives me the motivation to keep going! Thankyou! Very cool! I hope everything is working out well for you!